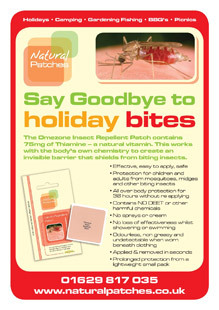 I am sure that Omezone provides an effective biting insect deterrent. After a recent 2 week caravan holiday adjacent to trees and fresh water when plenty of exposed flesh was available, I was only bitten once. It seems to be effective against midges and mosquitoes but not horse flies. - Lambscote, Lower Brailes ,Oxon. We used the patches in New Zealand, we found them particularly effective against Sanflies. - H Sumerfield. My wife and I used your patches whilst in Kenya alongside out anti marlaria medication. They were extremely easy and effective to use. My wife usually suffers terribly from bites. - J Cummings, Leicester. We visited Nepal and Bhutan using the patches as directed and were not bitten at all! Most efficient! - Robert & Mary Hummand, Masterfield, Wiltshire. 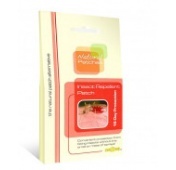 The Insect Repellent Patches seem to stop Mosquitoes and Sand-Fly bites to a minimum and less likely to inflame. The only downside is the smell of Vitamin B which seems to attach to cloes. However it is still worth it. Used the Insect Repellent Patches in Antigua and Tobago. Will buy again. - Howarth, Clitheroe. They actually worked, I could forget the Insects were there. Good product. Used in Florida. - S Southwick, Callow End. Actually worked better than anything else Ihave ever tried. Used in the Caribbean. Will buy again. - M Elleman, Burton On Trent. If you would like to enter a product review, please log in and go to the appropriate product page.